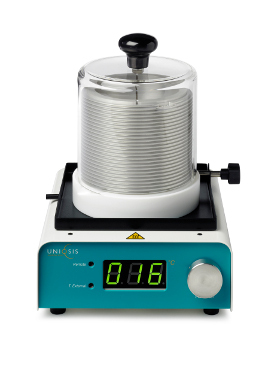 The Uniqsis Hotcoil is a versatile standalone heated reactor module that is compatible with all Uniqsis coil reactors. The unit can be combined with an existing pump to build your own flow reactor system or used as an upgrade to the FlowSyn to increase throughput for scale-up applications. Temperatures can be set either remotely (RS232, LAN) or using the 'push-to-set' control. The animated display indicates, heat-up, cool-down and steady state conditions and is easily visible from outside the fume cupboard.